From casual acoustic melodies at the coffee shop to throbbing electronic beats at teen clothing outlets, music is used to mold customer experience and behavior. But what impact does it have on employees? Cornell University researchers explored this question in a pair of lab experiments and found that music can have important effects on the cooperative spirits of those exposed to music. In the paper newly published by the Journal of Organizational Behavior, Cornell researchers Kevin Kniffin, Jubo Yan, Brian Wansink and William Schulze describe two studies they conducted to test the effect of different types of music on the cooperative behavior of individuals working as a team. For each study, participants were grouped into teams of three. Each team member was given multiple opportunities to either contribute to the team's value using tokens or keep the tokens for personal use. When happy, upbeat music was played - researchers chose the "Happy Days" theme song, "Brown Eyed Girl" by Van Morrison, "Yellow Submarine" by the Beatles and "Walking on Sunshine" by Katrina and the Waves - team members were more likely to contribute to the group's value. When music deemed unpleasant was played - in this case, heavy metal songs by less than well-known bands - participants were more likely to keep tokens for themselves. The researchers found contribution levels to the public good when happy, upbeat songs were played were approximately one-third higher compared to the less pleasant music. "Music is a pervasive part of much of our daily lives, whether we consciously notice it or not," said Kniffin, a behavioral scientist at Cornell and lead author on the paper. "Music might melt into the background in places like supermarkets or gyms and other times it's very prominent like places of worship or presidential nominating conventions. Our results show that people seem more likely to get into sync with each other if they're listening to music that has a steady beat to it." 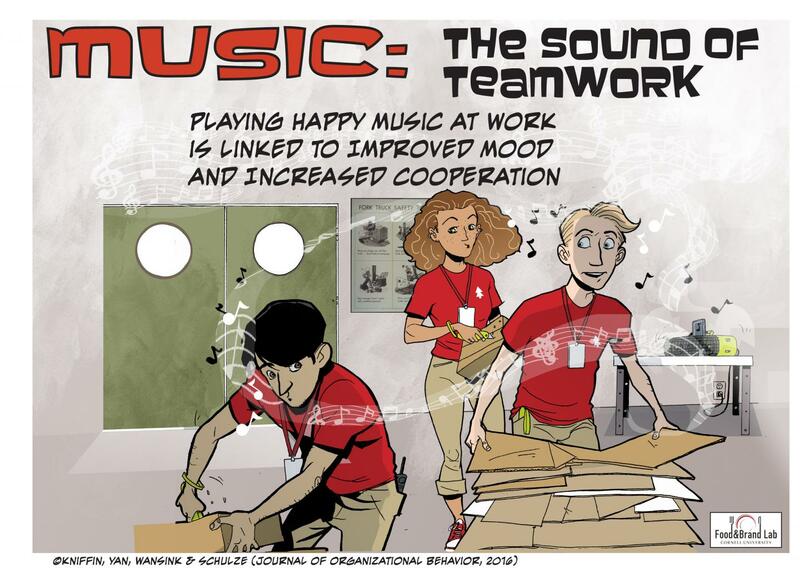 Wansink, director of the Cornell Food and Brand Lab, added: "What's great about these findings, other than having a scientific reason to blast tunes at work, is that happy music has the power to make the workplace more cooperative and supportive overall." The researchers suggest managers consider not only the customer experience but also workers' when picking the day's music. Starting the day with this simple consideration in mind could result in happier employees and more teamwork. "Lots of employers spend significant sums of time and money on off-site teambuilding exercises to build cooperation among employees. Our research points to the office sound system as a channel that has been underappreciated as a way to inspire cooperation among co-workers," said Kniffin.